All funds go to the Foundation against Cancer and will be used to support the scientific research, provide social care to people affected by cancer, along with their families, and promote prevention and healthy lifestyles. Learn more about it here. Do I stay for 24 hours at Relay For Life? Each team must be present at the event during 24 hours. To keep the solidarity as high as possible, it is desirable that each team member stays (if possible) onsite during the whole 24 hours. The visitors on the other hand come along for the ceremony moments or for other activities, but are not necessarily present during the whole 24 hours. As a team member, what should I bring with me to the event? 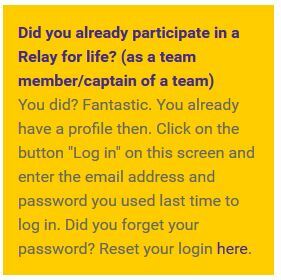 As a team member, do I pay a registration fee? Yes, every team member pays a € 10 registration fee. Payment error with message "Declined"
Payment information was incorrectly input: Please double-check that the name, expiration date, and CVV number on the card match what you had input in our system. To expedite resolution and to determine the specific cause of payment failure, please contact your financial institution as soon as you are notified that a payment error has occurred.